BRAMPTON - ACCESS never under-estimates the power of today's youth. Encouraging local students to take action on education-related issues and promoting social justice is a key part of ACCESS' mission, in addition to fundraising for projects in the developing world. 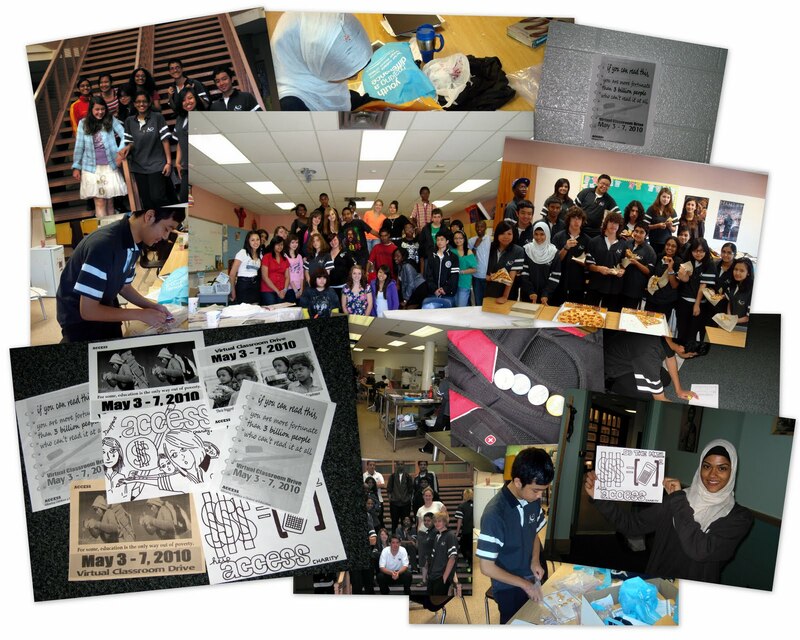 With passion for the cause, some students go above and beyond, responding strongly to their call to action. The World Issues group of Notre Dame Catholic Secondary School in Brampton, Ontario has helped raise thousands of dollars for ACCESS Charity through their newly organized Virtual Classroom Drive, ThinkFAST, and other projects centered on social justice throughout the 2010 school year. The Virtual Classroom Drive was a new school-wide initiative that encouraged classes to raise money and purchase school supplies for underprivileged children in Honduras and Tanzania. Each homeroom class was given a simulated order form, where students and teachers could collectively decide which school supplies they wanted to purchase with their funds. Choices ranged from chalk and pencils, which cost only a few cents, to uniforms and computers, which had prices of several dozen dollars. In order to maximize participation in the fundraiser, the Virtual Classroom Drive was designed as a competition between homeroom classes. Ms. Toubassi’s grade 10 class, who had raised $310, came out in first place and were generously rewarded with a pizza party. To ensure the success of the fundraiser, an extensive advertising campaign was posted throughout the school. The School Board's Catholic Education Week (May 3 to May 7) was devoted entirely to the Virtual Classroom Drive. Morning announcements, posters, banners, and individual presentations to classrooms all contributed to the overwhelming success of the fundraiser. By the end of the week, the school had raised $2050 for ACCESS. Aian Binlayo and Tanzima Khan, members of the World Issues group, were key individuals in the planning and organization of the fundraiser. Education; it’s my right, it’s your right, it’s everyone’s right! The Virtual Classroom Drive was only one of several initiatives held throughout the school year that aimed to raise money for various ACCESS Charity projects. During the liturgical season of Lent, the World Issues group held their annual ThinkFAST from March 26 to 27, 2010. This was a 28-hour fast in which roughly 100 students eagerly participated. Although students were given the opportunity to eat a few crackers and drink a single glass of juice, many participants opted to eat and drink and nothing at all. The participating students were able to enjoy many different activities, including various games, winning prizes, a sleep-over at school, hearing from guest speaker Daniel Francavilla, bowling, and finally a grand pizza party to break their fast. All participants had to collect and donate a minimum of $20 each in order to be eligible for this event. The total amount of this money was divided: half was given to support the project Development and Peace, and the other half was given to the IMUMA project of ACCESS Charity. This fundraising event was an astonishing success and Notre Dame hopes that it will be even more successful in the years to come. Furthermore, as part of their unit culminating task, Ms. Leggo’s grade 12 politics class hosted a fundraiser for ACCESS Charity’s IMUMA project. This fundraiser was held during the 2010 Parent Teacher Interview Night. With great success, the fundraiser raised over $600. While showcasing the great efforts of ACCESS Charity’s initiatives, the students hosted a Bake Sale and Gift Basket Fundraiser for both students and their parents. Additionally in April, grade 9 students painted Easter Cards for the orphans of IMUMA in Tanzania. Each orphan received a personalized painted card from a student in Mrs. Pighin’s grade 9 visual arts class. As part of Notre Dame’s motto, “Justice, Love and Peace,” students wanted to extend a sign of love to the children of IMUMA and let them know that young people in Canada care. Lastly, the grade 12 hospitality and tourism class, led by Mrs. Schulde, held a Bake Sale called “Window to Sugarland”. This bake sale was put together in order to raise awareness and money for ACCESS initiatives. These students baked many delicious treats, such as cookies, cinnamon buns, banana cake and brownies, all of which they sold to the students to support ACCESS. Throughout the year Notre Dame students held various fundraisers and charitable projects, many of which supported ACCESS. Each was done with special care and was successful in its own way. The students are glad that they were able to help various people in both their neighborhood and around the world, and pray that they can continue doing such great work. They would also like to encourage all other schools to initiate their own projects and continue to do their part in helping the world. ACCESS: Allowing Children a Chance at Education, Inc. is a youth-run organization aiming to provide needy children in the developing world with school uniforms and necessary school supplies, enabling them with the opportunity to obtain an education for a successful life. ACCESS also aims to educate North American youth about related world issues, and to inspire them to make a difference globally. For more information and resources, please visit www.accesscharity.ca.